SlingBag™ is a heavy duty woven polypropylene fabric tote with four polyester lifting loops designed to efficiently and safely store, move and place the burlap bags with a single point pick up. The SlingBag™ can be lowered into the water or onto a land job site. SlingBag™ holds fifty-six (56) 60 lb. burlap bags. 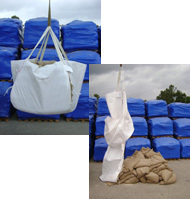 The SlingBag™ system saves time and is the most economical method of burlap bag placement. QUIKRETE® 10oz. burlap bags are a high strength, 4000 PSI blend of sand and cement that will bond together as one unit. QUIKRETE® burlap bags are 100% Biodegradable, environmentally friendly, harmless to wildlife and will give the appearance of natural stone.